I thought the book description sounded really interesting and was looking forward to reading this story. Unfortunately, I just wasn't able to lose myself in the story. It started out alright, but by the end of the book, I realized that the reason I couldn't get into it was because I felt like I didn't ever get to know the characters. I don't feel like we got to know them more than surface-deep. Because of this, I wasn't emotionally invested in the story, and ended up skimming for the last few chapters. Kind of sad, because the book had so much potential, if only there had been more character development. 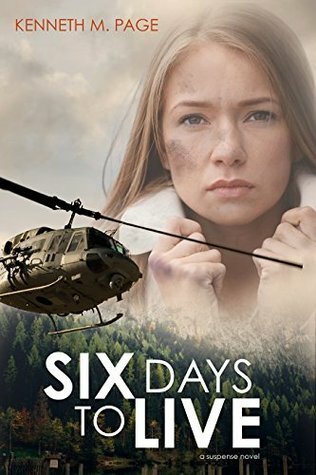 Most of what I've read lately would fall into the Clean Romance category, so I was really excited to read Six Days to Live and spend some time in another genre. The cover drew me in, and the first couple of chapters were quite intriguing. I had high expectations for this suspense novel, but sadly the writing just didn't do it for me. I didn't feel a connection to the characters and the dialogue didn't seem natural. It took me much longer to finish it than I expected, and I wondered if it was just my mood. I'm really curious to see what my reader friends think of this novel. Six Days to Live has a great premise, and I was really looking forward to reading it. I don't know...maybe more editing would have helped. It normally doesn't bother me if I find spelling errors, but these seemed to jump out at me. Maybe it was because the dialogue didn't seem to flow or follow normal speech patterns. Everyone was really polite to each other, until they blew up, and then they went back to being super nice. I also struggled with the end a little bit, and this is probably a spoiler, so be aware of that if you keep reading. All through the investigation we are told that if Chase gets anywhere near it there will be severe consequences. Understandable. Also understandable for a good story, Chase ignores these mandates and goes to find his wife anyway. However, after he almost gets his father-in-law killed, finds himself shot, and other not so great things, there is never, never any consequences for him. He is even asked to join a special task force at the end of the book (I'm not even sure why, because he didn't really do anything but get shot). Why bring it up and make a big deal out of it if nothing is going to happen about it? Plus, I was super confused when he got shot. The first time it says he got hit in the gut at close range. That's bad. But then he says it's just a flesh wound that went all the way through, and then says it got him in the side. What? Since when is a gut shot in the side? I'm probably just being too picky. It takes a lot of publish a book, and heaven knows it isn't a talent that I posses to write one, so take it all with a grain of salt.